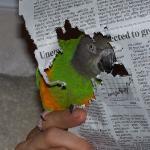 This article is about how to teach a parrot to fetch. I will only cover the bare basics and get into more advanced object retrieves another time. The basic fetch trick involves giving an object to a parrot, saying fetch, and then the parrot carries the object and drops it into a receptacle. In a later update I will cover how to get the parrot to go to retrieve the object on its own but this most basic version simply involves handing it to the parrot. Fetch is a basic trick that can be trained to any parrot. Even parakeets can learn how to fetch. The time span for teaching this trick can vary from a few minutes to a few weeks. Typically it should take 3-7 training sessions to get the most basic version of the trick learned. It is beneficial but not absolutely necessary that the parrot knows some basic tricks like target and wave prior to learning the retrieve. To teach the parrot to fetch is pretty straightforward and simple. You give the parrot an object to hold and then place a bowl underneath and wait for the parrot to drop it. Catch the object in the bowl, click, and reward the parrot. Over many repetitions of this process, the parrot will learn that dropping the object earns it a treat. To teach the parrot specifically to drop the object into the bowl rather than just anywhere, let it miss the bowl when it drops the object from time to time and don't reward. This narrows down the demands specifically to dropping the object into the bowl. While the first few training sessions simply involve dropping the object straight down or a slight turn of the head, you should eventually work on having the parrot walk across a perch to take the object from you and then to walk some more to drop it. I highly recommend using Parrot Training Perches for the initial training of this trick. By using this kind of stand you can eliminate distractions and alternate paths of travel. The parrot can pay attention to you and since it can only walk in two directions, increases the likelihood that it will bring the object toward the bowl rather than run off with it. One problem that I encountered while training Truman is that he really enjoyed playing with the objects I gave him. In fact he enjoyed playing with them more than performing the trick. There are several methods for dealing with this kind of situation. First off, let the parrot get it out of its system. Let it play with the objects a bunch so that they become less novel. The parrot still has to be interested enough in the object to grab it but not wanting to play with it all day. Another thing you can do with a parrot that doesn't seem to want to drop the object is to offer it an even better toy to play with in return for dropping it. Often times just showing the parrot a cooler toy will make it drop what it is holding to take the new one. The new one becomes the positive reinforcement reward. The method is differential reinforcement where the new object has more value than the old one so it is worth working harder for the better object. I did not run into this problem here but I know other people will. On the flip side of a parrot that won't let go of an object is one that won't hold it in the first place. Those parrots require a somewhat different approach. First try to experiment with different objects and see if you can find at least something that the bird will hold on to. If all fails, then try this. Use the target training method to teach the bird to target to the fetching object. Play target with the object a bit and let the parrot get used to going for the object. As the parrot puts its beak on the object, let go a bit and let it pull it out of your fingers. Click and reward this. So at first teach the parrot to pull the object out of your hand. Then start rewarding the times the bird holds the object for longer. At first it might just be a quarter second, then a half. Always reward the best times and ignore the worst ones. If the parrot at least holds the object long enough to fling it, you can use the fetch training method mentioned above (reward falling in bowl, ignore miss). The parrot will begin to learn to hold the object at least long enough to get it to the bowl. Another issue you may run into is the parrot dropping the objects on purpose. It is important not to reinforce this. Don't immediately bend over to pick up what it dropped and try again. This can turn into a game where the parrot drops the object just to watch you picking it up again. Whenever the parrot drops an object or misses the bowl, turn around and ignore the bird briefly. It is best not to bend over and pick up the object but rather pull out a spare. Pick up the dropped object a bit later. Once your parrot learns to take the object from you, walk over to the bowl, and drop it, it will have learned the simplest basics of fetch. However, do not stop here. Continue challenging your bird. Use alternative objects for the parrot to fetch as well as alternative receptacles. I recommend starting out with a very large bowl so it's hard to miss but then narrowing down to smaller and smaller ones to develop accuracy. Also change the direction where the parrot has to go to fetch. Don't let it get in a habit of walk left to pick up, right to drop. The parrot might not learn the actual concept then and would just be repeating motions. Instead, keep mixing up the direction but keep the concept of dropping objects into bowl the goal. I begin saying "fetch" from the first time I introduce the trick to the parrot. The earlier you start using the cue, the sooner the bird will pick it up. While it may seem strange to say "fetch" when the bird has no idea what the trick is and just holds the object to play, it just sets the training up and prepares it for hearing that cue once it catches on to the behavior. This is just the very first stage of teaching the retrieve. Stay tuned for more updates about how to teach a parrot to fetch objects. 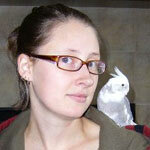 I have been successful in using this method to train a Budgerigar, Senegal Parrot, and Cape Parrot to learn to fetch. I couldn't see why a Cockatiel, Conure, Amazon, or Macaw couldn't learn to fetch the same exact way. If you have any further questions, feel free to post in the comments or join the discussion on the parrot forum. Very nice video and article, Michael. Now I need to put this into practice and get one of my guys to "fetch." I think I'll have more time this week, and will try to work with one of them on the training perches that I got from you. I'll let you know how it goes. BTW, how is Truman's recovery coming along? He looks great! Another great article and will come useful when I come to teach this... Thanks! My Indian Ringneck is learning a bit of fetch. He really initiated it himself and i managed to expand on it. He would fly down to my desk to steal objects presumably to get me to respond. Well at some point he showed interest in a wooden ball (that was his anyway). He would sling it around or pick it up and drop it off the side of the desk. I got to where I would say, "throw me the ball" while he was messing with it and hold my hand over the edge of the desk and if the ball landed in my hand he got a click and a treat.. if he flew off with it or missed my hand he got nothing. Sometimes he likes to actually throw the ball at me, and sometimes he rolls it, and sometimes he walks it over to me and places it in my hand. At first i gave him smaller treats for making the effort and larger treats for successes. Now I can roll it across the floor and he'll go back and get it. He's mostly locked into the idea of dropping it off the side of the desk, but i'm working on that by starting to put him in new locations around the house for it. I can tell when he's done playing because he takes it up to a nest he built (sorta built, don't ask) Anyway, the point here is that there is more than one way to train for this. Although I should change "Throw me the ball" to just "bring it here" that applies to all delivery methods and objects.